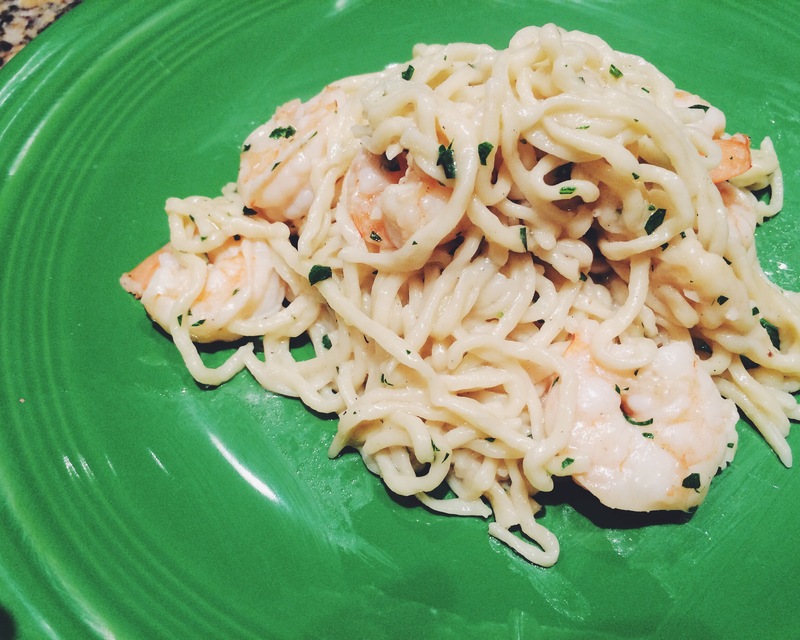 So, I gave the people what they asked for: Shrimp Scampi. Whenever I am about to make something, I make a game plan. I plan out steps. 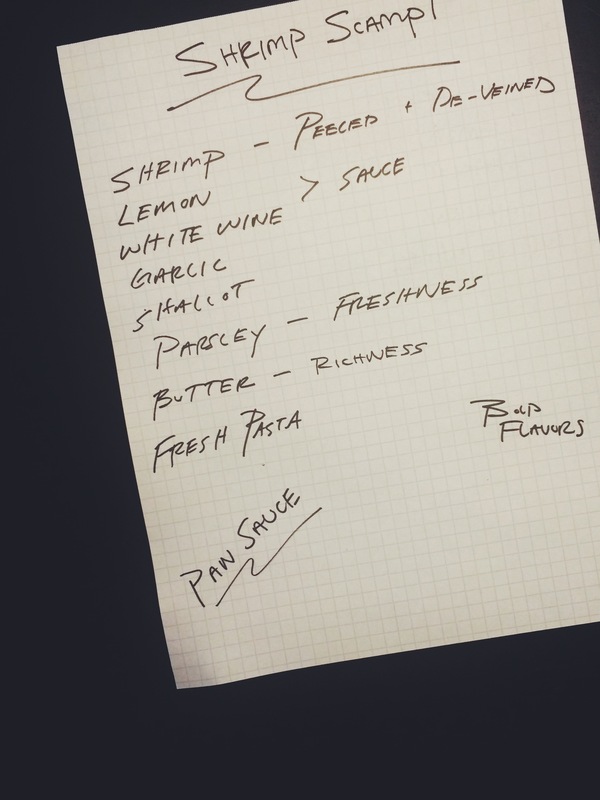 I mise en place (a place for everything and everything in its place…French for organizing and arranging ingredients). I do this for all cooking because it limits chaos and it makes cooking fun. I even draw it up. I kid you not. I do this every single time. And then I cook. I don’t measure anything either. I just guess as well as I can when I go back to write about it. I measure by tasting. Needs acid? I add lemon juice. Lacking salt? You guessed it…I add salt. A lot of times, cooking is a guessing game. In restaurants, line cooks aren’t back in the kitchen using tablespoons and measuring cups. They are using pinches of this and handfuls of that. After cooking for awhile, you just know how much is needed. Actual recipe creation in written format is time consuming. Just ask any cookbook writer. So, take every recipe I post with a grain of salt. Alter it to your tastes. THE INGREDIENTS. 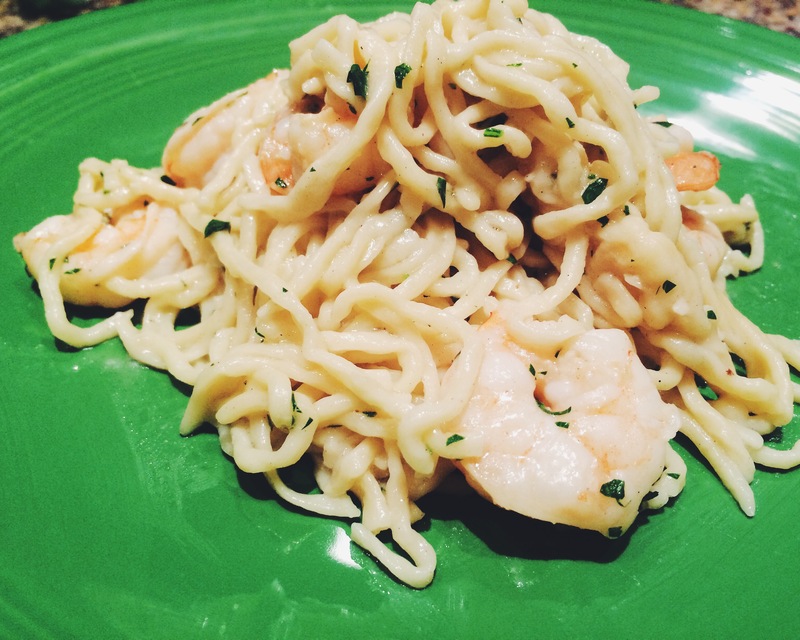 The success of shrimp scampi falls on the freshness of your ingredients. Gotta use fresh shrimp. Gotta use fresh parsley…the dry stuff is no good here. 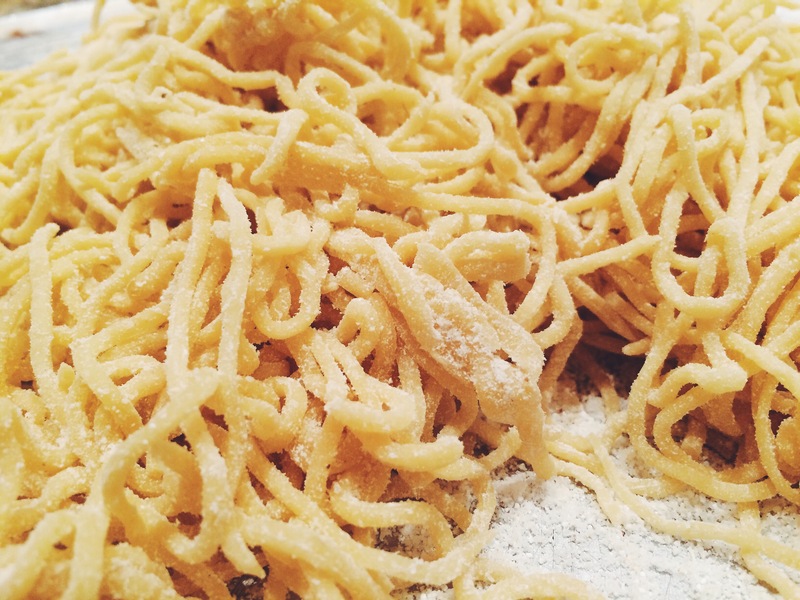 Fresh pasta (either handmade or store bought) is also the best option here. It just adds something that dry pasta can’t. You know what I am talking about if you’ve ever had freshly made pasta. THE METHOD. Once the process starts, it’s best not to stop it. So it’s important to have everything ready to go before you start cooking. In a large pan over medium-high heat, add some oil. Add you garlic and shallot and sauté until softened. Add the wine and the lemon juice, allowing the alcohol in the wine to cook out. Reduce the heat to low and mount the sauce with butter. Take small amounts of the butter and whisk it into the sauce. You will notice the sauce starts to thicken. Continue added whole butter until the sauce it as a consistency of your liking. Season the shrimp with salt and add them the pan with the sauce. The shrimp will slowly come up to temperature in the sauce and give it a delicious, shrimpy flavor. Once the shrimp are added, place the fresh pasta in the salted, boiling water. Fresh pasta takes only minutes to cook so it should be ready about the same time as the shrimp. Drain the pasta once it’s al dente, reserving some of the cooking water. 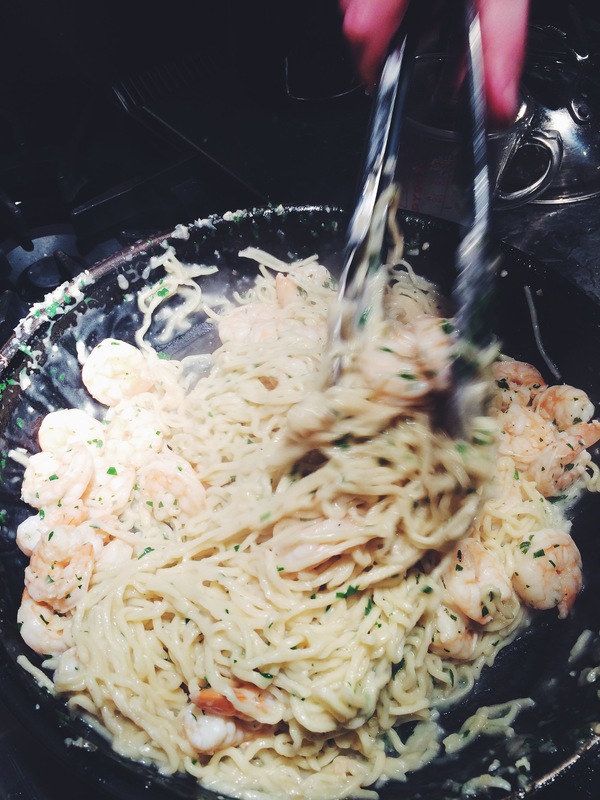 Add the pasta directly to the pan with the shrimp, tossing it all together. If it’s dry, add some pasta water. The starch in the water also helps to thicken the sauce even more. Finish with the fresh parsley. Toss and serve. ENJOY IT. It’s bright. It’s zesty. It has a subtle richness. It’s really quite delicious. Sure to be a hit at your next dinner party. It also has the added bonus of being thrown together in 10-15 minutes if all of your ingredients are prepared ahead of time.